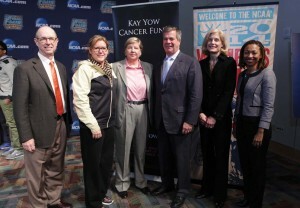 Lawrence Marnett, Ph.D., Mary Geddes Stahlman Professor of Cancer Research; Vanderbilt women’s head basketball coach Melanie Balcomb; Susan Donohoe, executive director of the Kay Yow Cancer Fund; Nashville Mayor Karl Dean; Vanderbilt-Ingram Cancer Center Director Jennifer Pietenpol, Ph.D.; and Assistant Professor of Obstetrics and Gynecology Dineo Khabele, M.D., were on hand for the presentation of a $100,000 grant from the Kay Yow Cancer Fund to VICC on Jan. 21. Photo by Anne Rayner. When the NCAA Women’s Final Four came to Nashville in April, it brought great basketball action, plus extra support for ovarian cancer. Annually, the Kay Yow Cancer Fund supports a cancer research grant to an institution based in the host city of the NCAA Women’s Final Four. This year’s $100,000 grant was awarded to Vanderbilt-Ingram Cancer Center to continue research on imaging ovarian cancer with novel small molecule radiotracers of cyclooxygenase-1 (COX-1). The award is given in partnership with the Women’s Basketball Coaches Association (WBCA) and The V Foundation for Cancer Research. Susan Donohoe, executive director of the Kay Yow Cancer Fund, presented Dineo Khabele, M.D., and Lawrence Marnett, Ph.D., with a ceremonial check at a news conference at the Vanderbilt University Student Life Center on Jan. 21, in advance of the 2014 NCAA Women’s Final Four. The Kay Yow Cancer Fund was officially founded on Dec. 3, 2007, from the vision of the organization’s namesake Kay Yow, former North Carolina State University head women’s basketball coach. Coach Yow was first diagnosed with breast cancer in 1987 before succumbing to the disease in 2009. The Kay Yow Cancer Fund is a 501 (c)(3) charitable organization committed to being a part of finding an answer in the fight against women’s cancers through raising money for scientific research, assisting the underserved, and unifying people for a common cause.